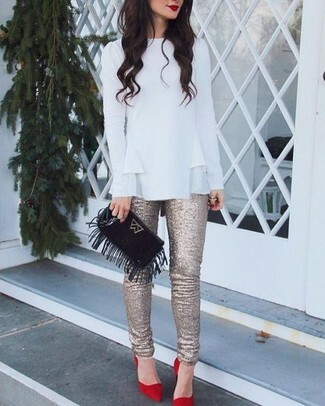 If you're searching for a casual yet totally stylish look, make a Simone Rocha ruffle blouse from Nordstrom and gold sequin skinny pants your outfit choice. Both garments are totally comfy and will look fabulous together. When it comes to footwear, this getup is complemented nicely with red suede pumps. If you're looking for a casual yet stylish ensemble, reach for a Simone Rocha ruffle blouse and a blue denim mini skirt. Both garments are totally comfy and will look fabulous paired together. When it comes to shoes, this look pairs wonderfully with tan leather wedge sandals. If you're on the lookout for a casual yet totally chic ensemble, choose a white ruffle long sleeve blouse and grey skinny pants. Both items are totally comfy and will look fabulous together. Round off with grey suede pumps and off you go looking nice. If you're searching for a casual yet absolutely chic getup, wear a Simone Rocha ruffle blouse from Nordstrom with black fringe jeans. Both items are totally comfy and will look fabulous together. Got bored with this look? Enter brown leopard suede pumps to shake things up. 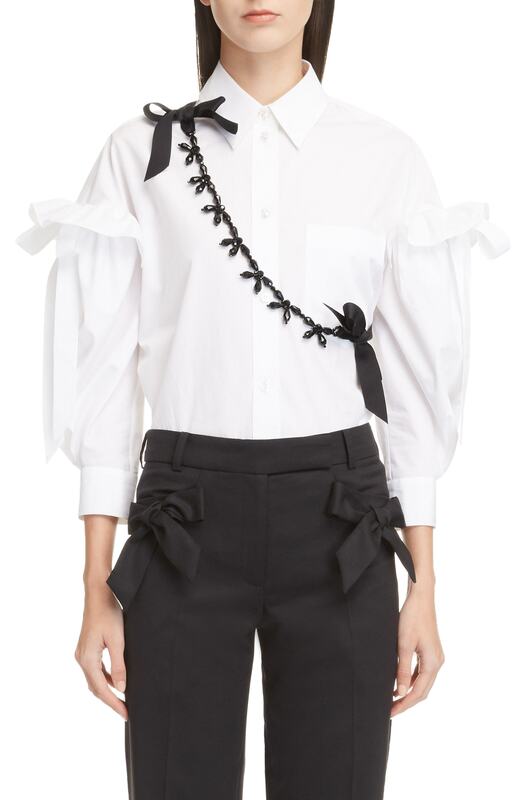 If you're searching for a casual yet absolutely chic outfit, consider pairing a Simone Rocha ruffle blouse from Nordstrom with black ripped skinny jeans. Both garments are totally comfy and will look fabulous together. And if you want to instantly up the style ante of your look with one piece, add navy suede ankle boots to the mix. If you're on the hunt for a casual yet chic getup, consider wearing a Simone Rocha ruffle blouse and a red textured full skirt. Both garments are totally comfy and will look fabulous paired together. Bump up the cool of your outfit by finishing off with red suede pumps. For a smart casual outfit, try teaming a Simone Rocha ruffle blouse from Nordstrom with a black suit — these items play nicely together. When it comes to footwear, this ensemble is finished off nicely with black lace pumps. If you're on the hunt for a casual yet absolutely chic outfit, choose a Simone Rocha ruffle blouse and navy shorts. Both garments are totally comfy and will look fabulous together. For a more relaxed take, make silver leather ballerina shoes your footwear choice. If you're on a mission for a casual yet totally chic look, consider wearing a Simone Rocha ruffle blouse and black skinny pants. Both items are totally comfy and will look fabulous paired together. When it comes to footwear, this outfit is round off nicely with black leather pumps.